Paris pledges will avoid worst-case climate change scenario. This should be the year we turn to preparing for the future. Maybe there’s hope after all. 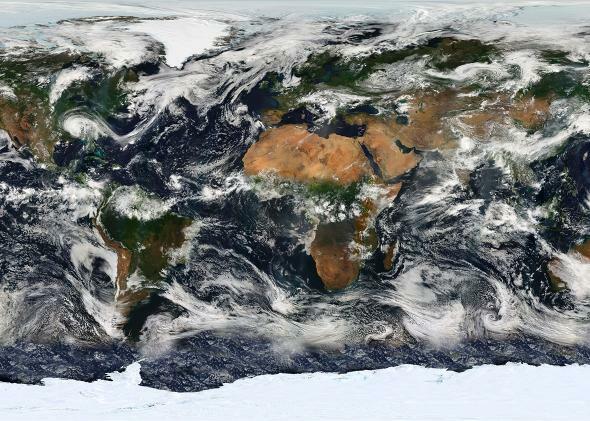 Above, Earth, based on observations from MODIS, a sensor aboard the Terra satellite. This month, world leaders will gather in Paris to negotiate the future of our planet’s atmosphere. Putting it that way may seem like overstating the meeting’s importance, but that’s exactly what they’ll be doing. On the table is the first-ever global agreement on climate change, and some media reports are playing up the sense of optimism in the air. And it’s true: There are a few very good reasons for hope. Given what we’re up against, even cautious optimism on climate change is momentous. The science of climate change is fairly simple, and it’s backed up by decades of observations: Human activities are releasing enough heat-trapping gases to shift weather patterns and fundamentally change the chemistry of the ocean. It’s going to take a Herculean effort to reverse the process—even though doing so would be worth it by nearly every measure. Reducing emissions quickly is the best solution, but after decades of delay, it’s getting really, really hard to make the numbers work. That’s why I’ve been really pessimistic about humanity’s chances of preventing a worst-case climate change scenario for a while now. I mean, really pessimistic. In a recent article in Rolling Stone, I made the case that it may already be too late to prevent the loss of critical biodiversity in the world’s oceans, with devastating consequences for all of us. Last month, the National Oceanic and Atmospheric Administration announced a global coral bleaching event that’s on its way to becoming the worst in history. A recent study into the value of the “ecosystem services” provided by coral reefs—a heartbreakingly wonky way of saying that people’s lives depend on them—found that reefs, which support a quarter of all marine life, were third only to Earth’s forests and fresh water supply in terms of importance to humanity. Nearer-term impacts of climate change such as these are probably already unavoidable, and in some cases, the longer-term viability of cities and ecosystems is still very much in question. We’ve never faced a problem like this in the history of human civilization, and it would be naïve to think that solving it will be easy. The scale of the problem is truly daunting, and it has prompted life-changing despair in many climate scientists. The blunt fact is that the world has done less than nothing to tackle climate change since it became a political issue in the 1990s: Global emissions have actually risen 40 percent since the previous international climate treaty in 1997 and very likely will keep rising until at least 2030 no matter what happens in Paris. So far this year, more than 150 countries have pledged to deviate from their own business-as-usual paths as part of a new global emissions reduction plan brokered by the United Nations. That’s a huge victory in terms of momentum toward the ultimate goal: transitioning to a zero-carbon world economy in an equitable way. Nothing on this scale has been achieved before, even though the current pledges aren’t enough yet. They would still commit the planet to a rise of somewhere between 2.7 and 3.5 degrees Celsius above pre-industrial levels this century—significantly above the goal of keeping warming below a somewhat manageable 2 degrees Celsius increase. An assessment by PricewaterhouseCoopers showed that the world’s 20 biggest economies are about a third of the way to where they need to be—which is not nothing, considering the enormity of the task. The U.N.’s own assessment of all the pledges, released last week, framed the remaining challenge most accurately: We’re definitely seeing a slow down of emissions growth, but no peak yet. That means we’re still going to be making the problem considerably worse for the foreseeable future, just not as bad as we could have. So, um, yay! While most close climate watchers—myself included—have bemoaned the fact that the 2-degree goal is probably no longer possible, there’s a huge achievement on the horizon in Paris that’s clearly worth a victory dance: The nightmare worst-case scenario, in which the planet warms by 4.5 degrees or more, is now likely off the table. Don’t get me wrong: We’re still in for some serious ramifications, and a middling climate path will be a disaster for many parts of the planet. Portions of Tuvalu and Miami are still likely to be lost to the sea by the 2080s, farming will become more and more difficult in large parts of the world as droughts become more frequent and severe, and forest fires will continue their unrelenting advance. But in narrowing down the range of possible climate change scenarios, the Paris summit will help lock us into a path on global warming that’s a bit more predictable and will allow cities and nations to better prepare for what’s to come. Of course, we can’t predict all of the repercussions of this less extreme (but still extreme) change to our atmosphere and oceans. There’s new evidence that the risks of this middling path have been understated in climate science reports and that the feasibility of still avoiding these risks has been consistently and irresponsibly played up. Last month, Kevin Anderson of the University of Manchester wrote a scathing commentary in Nature Geoscience to his fellow climate scientists, calling out the “almost global-scale cognitive dissonance” that we’ve already built too much fossil-fuel burning into the global economy to change course fast enough. In a companion blog entry, Anderson said speeches from scientists and politicians that claim global warming can still be kept below a 2-degree rise are “dangerously misleading.” As scientists, wrote Anderson, “it is not our job to be politically expedient with our analysis or to curry favor with our funders. Whether our conclusions are liked or not is irrelevant.” Anderson’s words are the harshest reality check I’ve seen of the 2-degree narrative. To drive this point home even further, an analysis by Glen Peters and colleagues at the Center for International Climate and Environmental Research in Norway showed that official U.N. climate scenarios for the rest of this century would require unrealistic emphasis on untested atmospheric carbon removal technology to meet the 2-degree target. Vox’s Brad Plumer has a good analysis of Peters’ findings. So, to meet the 2-degree goal, our only choice is to either invent negative emissions technologies or sharply reduce fossil-fuel burning over the next 10 years or so. Since the global energy mix hasn’t significantly changed since the 1960s, and current pledges by the 21st century’s big four polluters—the U.S., the E.U., China, and India—leave exactly zero room for the rest of the world by 2030, the latter scenario doesn’t seem particular likely. The sooner we realize that the 2-degree goal is lost, the sooner we can focus on preparing for the impacts that are in store, with an eye toward justice for the countries bound to be hit hardest. Admitting defeat on 2 degrees, in this sense, would be a great victory in Paris—as long as it’s the beginning of a discussion about how to cope with the implications. While the pledges in the runup to Paris have likely bought us a decade or so on climate change, and while it’s important for major world economies to focus on further reducing emissions, it’s also increasingly clear that 2015 will mark a major transition point in human history. We’re moving from the time when we could have done something to avoid global warming to the time that the world should begin to focus instead on how to deal with its impacts.